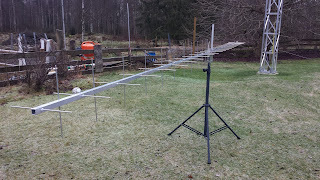 Now is the Christmas celebration done and I found some time to complete the trial antenna of a 25 el. horisontal GTV and a 14 el vertical antenna on the same boom. Assembled the 25el first and put my adjustable dipole on it and as is it showed a good match as the last time the adjustable dipole was used was when tuning the 4 25 el yagis I built this summer. Assembled the 14 el vertical parts and measured the horizontal antenna again and it showed absolutely no difference at all. 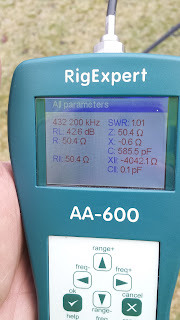 Moved the adjustable dipole to the vertical antenna and the results was very close to the horizontal antenna without any tuning at all. Manufactured dipoles for the two parts and measurements did not change anything at all so I am convinced they will work as expected. 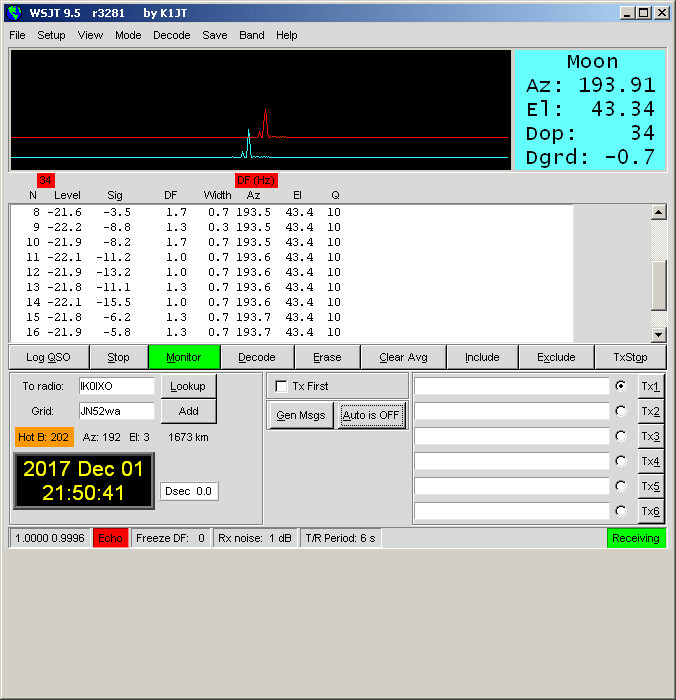 Will try polarisation performance after the new year on tropo and over the moon to verify. Will add a piece of coaxial cable with loss making up the difference in gain between the two parts before a relay and preamp to evaluate it easier. Did work some of the moon the last few days and the propagation has been vary shifting. From time to time very good signals and good own echoes and other times very poor. 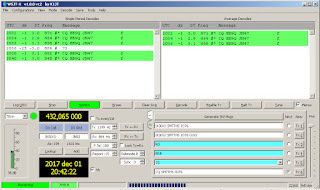 To Asia the propagation has been very poor for my only horizontal antennas. 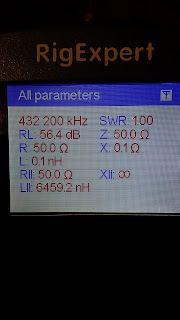 Worked Rob PD7RKZ that uses 8 times 11el GTV antennas and only 25W quite easilly which is for sure the lowest power station I ever worked and he worked smaller stations then me which is really amasing. Tried to work Hartmut DG7YBN too but we hrd eachother at different times and never at the same time so no complete QSO yet. 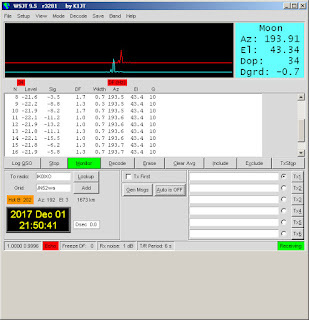 Tried to work some tonight but it was raining some sticky frozen rain which caused some SWR and caused the preamp to break down so Went QRT. Removed the preamp and the relay and the relay was OK but the preamp was confirmed broken. Will exchange it tomorrow when the rain has stopped and in daylight. Has not had the time to more in detail evaluate the SAV541+ preamp boards so I will continue with my YU1AW ATF ones for now. Christmas time is here and it starts with a big storm. Very high winds at the moment and we have had a power failure for an hour or so allready and it will build until midnight and them according to the prediction decline rapidly tomorrow morning. Added some extra supprt to the antenna system to avoid it all to move to much in the wind and it seems to withstand the gusts quite well. Will have few days off and will evaluate my future designchange by adding vertical antennas in front of the antenna supports. Simulated and decided to us a 15 el based on Hartmut DG7YBN's 14 el GTV antenna. 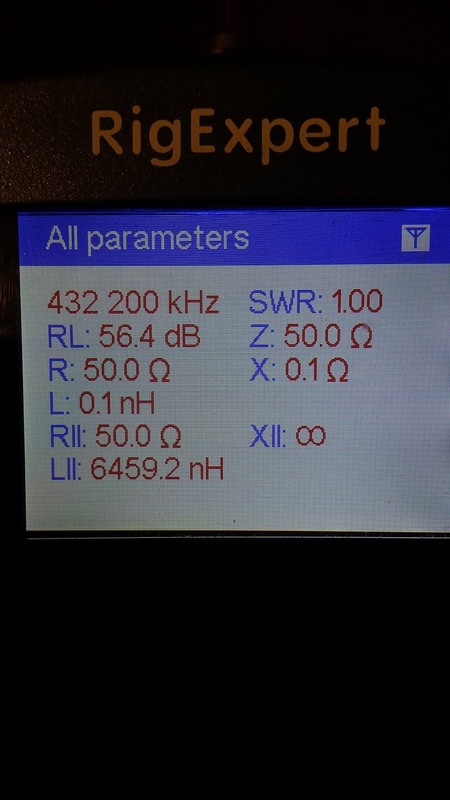 Will also make the 2m setup and connect the transverter with the amplifier and the HF rig. Like to make it work with both the tentec orion and any of the Anan SDR rigs. Have a set of SM5BSZ WSE boxes for 2m that I will use for EME on 2m but that setup will have to wait as I have no antennas for 2m EME at the moment. But now will I spend the whole Christmas with the family and I wish you all a merry Christmas and a really happy new year. Tried to work the V31eme dxpedition the past weekend but the polarization was not at all favorable. Listen for approximately 9 hours and did not get one single decode. At one point I saw a weak trace but it disappeared again. Others reported the same and the ones that could work Uwe most of them had the possibility to RX vertically. The polarization seem to be better when Uwe had the moon highest on the sky but that was some 1 hour after my moon set. But that's life and a big congratulation to them who managed to work them. The Gemenides MS shower is starting to get some good reflections and I worked UA3WM with huge reflections. One was 12.5 seconds and really strong. Tried to work last night but had massive VSWR as the antenna was completely covered with snow and ice. Lets hope it will melt away until tonight and tomorrow but I do not think so as the temperature will stay on or below zero for the whole time. Got my PCB's for the preamp evaluation and just tested them quickly and got some results but had some problems with instability and the Nf was in the order of 0.6 so further work and tuning is needed. Yesteray eavning the propagation was really good with very good reflections. Noted my own echoes at -3.5 dB and HB9Q was constantly -1. 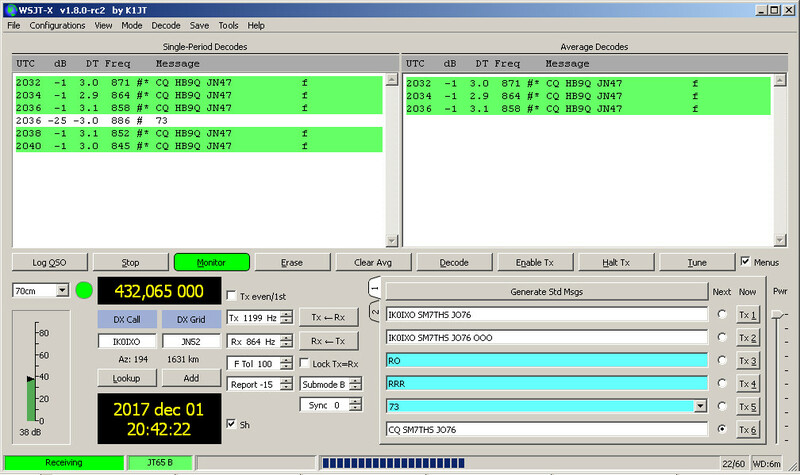 Worked 3 new stations and my first SSB QSO with Karl DF3RU who was 54 and solid copy all the time. Did ocationally hear my own SSB echoes too. Also worked OK2AQ who has a single yagi and 250W with good signals. Today I have so far worked 3 new stations including BV3CE whom I tried to work yesterday without success. Waiting for the V31 dxpedition that now stated will be QRV next weekend 8 - 10 December. Have not got the PCB´s for the SAV541 preamp evaluation yet so no work there but the hardware clocks have arrived for the VK5DJ controller so that I will finalize this week.